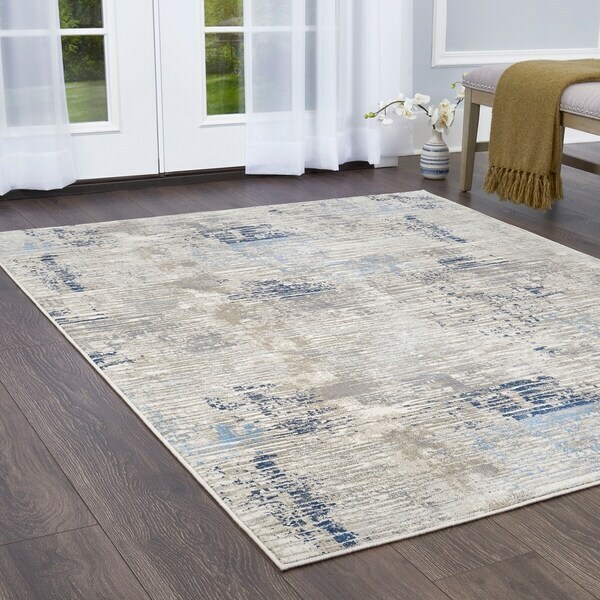 Melrose Modern Lines Gray-Blue Area Rug by Home Dynamix - 5'2" x 7'2"
Melrose Modern Lines Gray-Blue Area Rug by Home Dynamix - 7'10" x 10'2"
Melrose Modern Lines Gray-Blue Area Rug by Home Dynamix - 4' x 5'4"
Melrose Modern Lines Gray-Blue Area Rug by Home Dynamix - 6'6" x 9'6"
Welcome fresh, modern design into your home with the Melrose area rug collection by Home Dynamix. The Melrose collection features contemporary abstract prints, mesmerizing Moroccan-inspired designs and bold geometric patterns to transform any room in your home into a stylish oasis. Add a subtle pop of color to your home's décor with rich oranges and cool blues that are perfectly paired with neutral beige and gray tones for a beautifully balanced look. With an eye-catching blend of soft polypropylene fibers and mod design, you'll be greeted with fashion and coziness every time you come home. Naturally stain and fade resistant, these high-quality polypropylene area rugs are ideal for high-traffic areas within your home including entryways, your living room, bedroom or family room. Decorate your home with this luxe area rug collection that offers a soft, comfortable feel underfoot and delivers a stunning design statement your guests will adore. Requiring low maintenance, the Melrose collection the perfect choice for you and your fast-paced life; spot clean as needed and vacuum regularly to restore your rug's beauty. Layer these rugs overtop existing carpeting to define areas or create visual interest within your home, or place over hardwood or tile flooring to protect your floors and provide long lasting beauty for many years to come. Although the jute-latex backing on this luxury rug is gentle on most floors, it is recommended that you use a non-skid padding underneath to protect floors and minimize any slipping of the rug as you walk. MODERN ADDITION TO YOUR HOME: With a blended color palette of orange, blue, grey and cream and designs featuring geometric and abstract prints, upgrade your home's décor instantly with this contemporary addition. >ENDLESS DECOR OPPORTUNITIES: Enhance your bedroom, living room, dining room, den or entryway with this breathtaking décor must-have. It's picture-perfect in every indoor space! HIGH QUALITY AND DURABILITY: A unique blend of fashion, function and design. Design that exceeds expectations with a high-quality construction for long lasting beauty. SIZES FOR EVER SPACE:Our collection includes a variety of sizes to ensure you choose the size that fits your needs. Within this collection you will find traditional rectangular rugs along with round and runner size area rugs! quality rug,excellent colors. very representative of the photo online. The rug was a big success. It looked exactly as it did online. It was meant to tie together a blue sofa which seemed out of place. Wow, it worked beautifully! I have had many complements. I was very pleased. Light weight and durable rug. Quality is nice. And looks amazing in our lake front place. "How thick is the pile?" The pile is approximately 0.5 inches thick. The pile height is approximately 10 mm. Melrose Modern Lines Beige-Orange Area Rug by Home Dynamix - 6'6" x 9'6"
Melrose Modern Geometric Ivory Blue Area Rug by Home Dynamix - 7'10" x 10'2"